After coupons, I paid $8.94. Now, if you’re wondering why on earth I spent $2.19 on a box of Hello Kitty Band-Aids, it’s because Kaitlynn has been talking about the Strawberry Shortcake bandages I was planning to buy ever since she saw me print this coupon out. She was so excited I was going to buy them that she asked repeatedly if she could come shopping with me on this trip. When we got to Target, they were completely sold out of all Strawberry Shortcake bandages. I could see how disappointed she was when I tried to explain this to her so I decided to let her choose another box of character bandages instead. Was it frugal? No. In fact, I can’t remember the last time I spent $2 on a box of bandages. But it made my little girl’s day. And while I believe strongly that a parent shouldn’t give a child everything they want, I think it’s wonderful to occasionally let go of the frugality and buy something just because it will brighten someone’s day. It was a $2 well spent. « Q&A Tuesday: How do you find time to read? Totally worth the $2. I love saving money, but I also love making my children very happy. My daughter is also obsessed with Dora Bandaids. She will even make up fake owies in order to ask for a Dora bandaid. Usually its so sweet it’s worth wasting a bandaid to make her imaginary owie feel better. Aww, it’s worth it! I know, I bought my toddler a bag of pretzels for 1.38 and they’re normally 1.00 on sale which happens every 4-6 weeks, but I figured everything else we bought was on sale and it didn’t hurt. I think its awesome that you did that! It’s something simple that made her day! I got a giggle out of the Men’s body wash with Sparkles!! 😉 Are you sure about that? Just totally kidding. 😉 My husband totally cracked up when I told him about this post, my mistake and the ensuing comments last night at the dinner table! Good for you! That $2 made her day! Our not-on-sale splurge this week was a $3 mini basketball from Target. But, that $3 I *would* have spent on a fountain soda anyway (my weakness!) is going to much better use as we have been playing outside with the basketball and spending quality family time all afternoon! AND it was the best $2 you spent! I absolutely agree with you. Anything to make your child smile and fill with joy! I love it!!! I think that was so sweet of you, I wish more parents would do little things for their kids. Not spoiling but enriching and rewarding her for not begging. This Grandma says you made the right choice in the bandages!! Not much money to spend on someone so loved anyway! I too frequently spend two dollars on character bandaids. As crazy as it is. My daughter has every strawberry shortcake movie and almost every toy… Due to grandparents that spoil and the fact that since she was 1 (she is almost 5 now) this has been her only fad. She has never changed to princess’ or dora or anything else. My 4 year old is accident prone it seems and until we found strawberry shortcake bandaids the littlest scrape resulted in hour long sessions of crying. Since the finding of Strawberry bandaids, all boo boos now last a matter of minutes because strawberry makes everything all better. Even when we go to the doctors she brings her strawberry bandaids. Love the band-aid story! So true! Good for you! That’s one aspect of my philosophy. It’s not just about the character bandages – it’s about making her day. Tee hee. I’m not sure my husband would use “men’s” body wash with a Touch of Sparkle ;-). If the coupon was for mens bodywash why are you using it on womens?Is that allowed? I had the deal written incorrectly since I copied and pasted it in from another post and forgot to change it. Sorry for the confusion; I’ve fixed it now. I think it’s awesome you did it! It let’s her know that while being frugal is important it’s also okay to splurge once and a while. Agreed! Sometimes its not about how much the product is worth its about how much it means to the receiver. I am a super frugal mother but sometimes you just gotta live 🙂 I don’t believe that money or the things bought with it should be the source of all our joy but I also don’t think the fight to save money should rob us of EVERY pleasure!!! $2 on a special surprise is frugal in my book! I agree, that was $2 well spent. There are some really good deals but for some reason I am having trouble printing from the target website. I have done it in the past but just got my computer back it had to be completely wiped out. I can print from coupons.com but for some reason I am having trouble with target. It says to check the default printer when I try to print but the funny thing is on the target website it lists my printer and says “okay to print”. Anyway, my target doesn’t let you print out the coupons on their machine any more so I guess I loose out. Question. I know this isn’t exactly about the target shopping trip….. But if I have 2 Buy one get one free coupons, would that make my product free? I remember when walgreens had a buy one get one free and I had a buy one get one free coupon it was free, correct? Thanks! Still learning all of this. We had the exact opposite problem with the bandaids today. Our Target was all out of the Shrek kind and only had Strawberry Shortcake. I have two boys, so I chose to pay a little more for the Hot Wheels tattoo kind. They ended up being $1.42 and I had two happy boys! i understand about how wonderful it is to let go of frugality and to do something special for the kids….so often i can obsess or get stressed out if i’ve overspent for a product or missed a great deal. It’s so important for us to remember all the good gifts that our Heavenly Father lavishes on us! Love your perspective on our Heavenly Father and how he delights in giving us good things. I think that it’s all of those dollars we save couponing that allow us to be able to give our kids little things that make them happy! It’s much easier to justify spending an extra dollar on a hotwheels knowing that I saved so much on everything else! I completely understand, my daughter is OBSESSED with bandaids so much that I actually gave her a box of them (amongst other things) last week for her 3rd Birthday…she was soooo thrilled! I agree with you, its right not to give a child everything they want. However, it wasn’t a random thing. You promised her she could get this prior to going to the store. The details had to change due to supply and demand, but a promise is a promise. Thank you for posting things like this, its good to read about. Good for you! 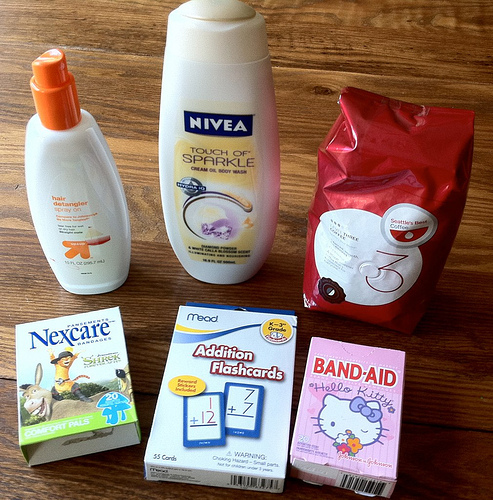 I love a mom whose idea of a splurge is $2 on a box of Hello Kitty band-aids for her little coupon-carrier. Now you know what to ask Santa to put in her Christmas stocking! Maybe he can stock up when they are on sale. i’m still new to this couponing stuff, so i had a quick question about the Nexcare bandaids…..i printed a coupon for Nexcare that says $1 off any Nexcare skin care product…..does that apply to bandaids? I saw that coupon…I think it refers to their supply of creams and lotions and skin crack care, not necessarily to the bandages, though. I had a printable manufacturers coupon for $1 off any nexcare product that worked for the bandaids. Not sure if this is the same coupon you have…but it worked great for me. Just had a little giggle over the fact that your pic has “A touch of sparkle” body wash and your description states “body wash for men”. Thanks! Sorry for the mistake. That’s what I get for lazily copying and pasting the deal in from another post and forgetting to change it! Sometimes it’s nice to splurge on the little ones. She will remember that for a long time. Where in the store did you find the Mead flash cards? I searched all over and could not find them. Ours were in the section that has the “little kids” art supplies…like glue sticks, stickers, etc. Well the way I read it, you kept a promise to your child. And that is priceless. I agree with your post. Also to tie this in with the previous article on “hand-me-downs”…I have two teenage daughters (three years apart) and I hand down clothes from the oldest to the youngest. Not only is it money saved, it is a sanity saver when out of the blue, jeans don’t fit, or she needs shorts for basketball, etc. BUT, my husband reminds me often, that my second daughter deserves some NEW things, too. So she does get some new things for school, birthdays, x-mas, and usually a new outfit for summer because she deserves to feel special, too. Little splurges are OK! LOL on the sparkly “men’s” body wash!!! 🙂 And I love that you bought your little girl fun bandages! Great memory!!! I’ve done the same thing many times!! I usually shop with my 4 year and 20 month old, and if they behave I usually end up buying them something. I don’t everytime but I know they don’t enjoy couponing as much as I do, so I try to reward them for sitting quietly in the cart. So usually I’m super excited to get my purchase for a few dollars, but sometimes I spend just as much on the childrens prize. That’s why I’m so grateful for all that I’ve learned couponing and saving money; because I have the extra dollars to spoil my kiddies 🙂 Your site is wonderful, keep up the good work! I will do the same thing for my son. When he is really good, or just a “normal” 2 year old good, I will get him a special treat. The way I look at it, he gave me a special treat by letting me shop in peace (which really isn’t in the job description of a toddler), so he deserves a little treat too. That is very sweet. Honestly….we used to be an instant gratification famly until I started to coupon so now when they get something without a coupon it really is a treat …..and guess what….I feel lik my kids appreciate things more and have stopped having the attitude that they have to have it now…..we have become a lot more patient. Again….very sweet story! That doesn’t look like Nivea for Men??? I also made a trip to target today for almost the same reasons… but one deal I foung and thought I should share was thier fruit rollups, as soon as I walked in the door my target had them in the dollar bens a pack of 4 for $1 and I used the $.50 off 2 coupon in last sundays paper paying a $1 for 2. But I also used the band aids coupon as well and there were some at my target and my daughter held the box until we checkedout as well. funny! Totally agree with you. Sometimes you just have to! Good trip. I agree completely and I can just imagine your daughter getting “hurt” to use her new band-aids. I’ve been managing my family finances for a couple months now and have implemented a more frugal approach. While I’m doing just fine (I cut back months ago) I have to realize that my husband has to adjust too and there are just somethings that I can’t be frugal with. In our case, there are little frugal options for golf. However, I do make sure he realizes how much it truly costs so he can make better choices while he’s golfing (ie. bringing his own snacks, drinks, looking for good deals). I wanted to share with you, as well, that Amy Dacyzyn has a need little article in her Tightwad Gazette book about treating her children to junior ice cream cones at the mall. Since they barely ever entered a mall, this was a treat and she noted how they “lapped up” every drop of the junior cones. She was mentioning that it made her proud that they could appreciate a small treat, because life didn’t hold such treats everyday. I think your band-aids are a sweet example of children appreciating some small allowance for joy, simply because it isn’t an everyday occurence. haha I thought I was the only one! My 3 1/2 year old daughter is obsessed with band-aids too! I was able to score the Strawberry Shortcake ones at Target…she LOVED them & they were super cheap. We have the Hello Kitty ones too! : ) Who knew band-aids could be so cool???? That’s women’s body wash in the photo. Will Target let you use the men’s body wash coupon on the women’s body wash? If so, I’m going to get some! That’s my favorite brand. I used the coupon from the Beauty Bag. I had incorrectly posted it earlier; my apologies on the confusion! it’s not the target coupon that’s the issue, it’s the newspaper coupon that is for men’s only. it may have worked but is it ethically right? Sorry for the confusion! My coupon said that it was good on “any body wash”. I double-checked it just to be sure. I’m hearing that maybe different areas got different coupons on this one? That is what makes you a good Mom!! I love the fact that you made her happy, even though I agree that we can’t always give our kids everything they want. Also, I’ve noticed that trying to be frugal and use coupons and only get good deals can almost make my attitude become stingy, if you understand what I’m trying to say. When my kids were younger they loved character bandages also! Some things go with certain ages! I’ve been meaning to try that! Yep, that’s what I do for me now, too. I couldn’t justify spending the money on spray-in conditioner anymore. I just buy the cheap conditioner and combine it with water. Super easy, super frugal and it works great! That sounds like a great idea! What ratio of water to conditioner do you use? I was in Walgreens last week planning on using my RR before it expired. It was only $1, so I thought maybe an Icee, but then my son saw little play cars, and the one he REALLY wanted was a Lightning McQueen car for $5. I almost never buy a toy for him just because, but decided to just go ahead and use the RR. He really loves that car. Wow, I’m staying over on THIS site. Things are getting ugly over on the FB link to this post. Don’t people realize they’ve just wasted half an hour of their lives on something that makes not one iota of difference in their lives?!??! Sheesh. Keep it up Crystal, you’re a great mom! Sad. You’re a wonderful mom. When my daughter was 3 she loved character and colorful band-aides too! (she’s now 11) Everyone gave her band-aids for her birthday that year and she was the happiest 3 year old in the world!!!! Some people thought it was odd for her to like band-aids so much, but we thought it was innocent and cute. Your story of your little girl brought back a lot of memories of when our daughter was that age too! Good job Mom! This may be a memory she has for the rest of her life, the time she got the special bandages when she went shopping with Mom. You made me smile. Thanks for sharing. I ventured out to Target today for my first time using what coupons i have clipped, and while I am sure I could of done things differently and paid less, I still saved. It is definetly a learning process as I read all the blogs and try to figure it all out. I was bummed that they were all out of the mens body wash 🙁 But I saved those coupons for a later trip. First transaction was: I got 2 boxes of the strawberry S.C. bandaids, used 2 $1 off coupons, paid .68 each, 2 Mead flashcards, used 2 $1 off coupons, paid .79 each. Bought 2 gillette items, one was $4.99, used a $2 off coupon, and one was 9.49, used $4 off coupon, and got $5 gift card. i also had a target coupon for buy 2 of certain products receive $5 gift card, so I got a 12 pack of bounty paper towels $12.99 used $0.25 coupon and pack of charmin toilet paper for $7.99 used $0.25 coupon, and received another $5 gift card. That transaction I paid $34.24 after tax and got 2 $5 gift cards. I then used those 2 gift cards on my next transaction for another set of the paper towels and toilet paper as before, 12 pack of bounty paper towels $12.99 used $0.25 coupon and pack of charmin toilet paper for $7.99 used $0.25 coupon, and received another $5 gift card. 2nd transaction I paid $11.80, and i have a $5 card for the next trip to target. Total was $63.38, minus $11 in coupons, received $15 in gift cards, used $10, still have $5 left. Spent $42.38 , saved $27.38 and I am now set with toilet paper and papertowels for a while. Hoping next trip will be better. plus, as we were picking up the paper towels my 8 year old noticed that some of them had a packet of coupons inside them with a savings over $30. So he searched through them to find another package with the coupons. SCORE! Crystal! I LOVE your website and your posts! Yes, it was $2 VERY well spent. I’ve been waiting for a chance to go get my band aids just because my kids “need” them on “invisible boo boos” and we go through them fast. That makes sense about the bandaids giving them a sense of comfort and safety. Maybe I’ll move a little faster the next time I hear, “Mama I neeeeeeeeeeeeeeeed a bandaid!!!!!!! Good job…I would have done the same. Face it, they won’t go bad (bandages) and your child’s smile is priceless. Your daughter is too funny! My 2-year-old is also obsessed with fun bandages (for her it’s Winnie the Pooh) and whenever she gets a scrape or cut, the only thing that makes it all better–even more than my kisses!–is a Winnie the Pooh band-aid. I think it’s adorable and well-worth the extra couple bucks to make her happy on this particular count. yeah! I love it when the simpliest thing makes someone so happy! My mom gives fun bandaids in Christmas stockings. We couldn’t afford them for 7 rural children the rest of the year, so it was a special treat to have our own box. We usually made them last as long as we could. I picked up the Strawberry Shortcake bandages last summer when I had a great coupon deal for them. No kids in this house so I didn’t plan on using them on exposed areas and even thought I might pass along to someone at some point. I ended up getting scratched by my cat in the middle of the night on my face no less and had to open them up last week. It put a smile on my face the next morning when I looked in the mirror and had a Strawberry Shortcake bandage on my face at 35 years old. I totally agree that this little splurge for your daughter was worth it. What’s the point of saving with coupons on everything else, if you can’t enjoy spending a little bit once in awhile to make a loved one happy. guess I’m a little ‘out of touch’ with bandage costs and couponing, because $2 didn’t sound outrageous to me for a box. 😉 I just pay what they cost when I need them. Love it!! Great job momma!! One of the things we learned while in school for education was that a bandage was very inexpensive if it really make someone’s day! If a person comes to you or to the office and a band-aid will make their boo-boo all better be glad that is something you can fix so easy. As an inner city teacher believe me there are many things that are not fixed so easily. I am cracking up…I LITERALLY have TWELVE boxes of ALL SORTS of bandages under my sink. My 3 yo loves them…A band-aid is part of her bedtime routine!!! I have been following your blog for over a year now, and I can honestly say its one of my favorite blogs, because you focus on much more than just coupons. When I first began couponing I was under the impression that by clipping coupons was the only possible to save a buck. But once I started reading your blog, I learned that time is also precious, and family is much more precious. I have a 3 year old, and recently we were going to introduce our little precious angel (our little girl), but we had to say goodbye to her too soon. I got pregnant in September of 2010 and were extremely excited, and I was doing my thing. In January of this year we found out she had a lung tumor, and we remained calm, and at times very scared. We kept thinking it would just go away as she grew and matured, but in late February everything took a turn for the worst. I got hospitalized and put on bed rest when we noticed I was contracting. Your blog kept me in the hospital sane, and Yes at times I would just browse through the internet to keep the time pass by . I obviously couldn’t concentrate on anything other than my baby girl, but I kept reading and remembering some of the things I have read and come across that were inspirational. (for example, the wonderful post you put during xmas one day,) and just little things like that. Well, I ended going into labor, when my water broke, and she had to be taken out via emergency csection, and she got operated on asap, and we got to meet, and I held her in my arms, but she passed away while I held her. It was the worst day of my entire life, and It definately puts a deeper meaning to what life means to me. Sometimes we take things for granted, or we take ourselves too seriously, that we forget the reason we live for, and the very thing sometimes is right in front of us….for me, my family. I have always thought this way, but my precious baby girl has given me much more meaning to my life. Thank You for your wonderful words…. I felt like sharing this maybe because I’m missing my wonderful husband who is now serving in Afganistan, and for some reason typing away allows me to feel good, and share a little about me to the world. Thanks. My heart goes out to you, Laura. Thank you for sharing here. Thank you and your husband for his service and the sacrifice you make each day…I’m so sorry for your loss. Thank you for the reminder of how precious life is an every moment is important. Laura, I am so sorry for your inexpressible loss. Things that we think are important really are not when put in the light of our family. God bless you and your family. My heart goes out to you. I cannot even begin to imagine what that was like. Laura, your message had me crying all over the place. I immediately went to my little ones’ bedroom and cuddled with them (they’re fast asleep). I can’t imagine going through your pain. I’m so sorry for your loss. Life is really rough right now, but you really put things into perspective, thank you. I’m so sorry to hear about your loss, Laura. Sending prayers and good thoughts your way. Also praying the time will pass quickly until your husband returns from Afghanistan. Love it! Kids are definitly worth letting go and paying full price at times. There little smiles and the joy they show makes it all worth it! We aren’t into characters, but my 3 1/2 year old daughter loves drawing animals and smiley faces so when we went on a long trip recently, I bought 2 [free] boxes of plain Nexcare bandages at every Wal-Mart we stopped at along the way. Then, in the car, I gave her permanent markers (I sat beside her!) while she meticulously drew pictures on every single band-aid. We even gave Grandma a box with all of her “pretty” band-aids, which Grandma LOVED. My daughter is so proud of them and, although she never gets any owies, it’s amazing how many of her stuffed animals do! Thanks for the great idea! I just found my next rainy day craft project!! Oh my, that is HILARIOUS. Thanks for the laugh! Hysterical!!!! Thanks for the laugh! I work in a dental office and we recommend Carmex all the time, but I’m gonna share this with my patients!!! Priceless! Bet he never made that mistake again. My new motto is “educational or disposible”. If something fits into one of those 2 categories, and also fits the budget I find no worries about adding it to the cart. I would say that character bandaids are the perfect way to add a favorite “toy” into the house, without having to make the room for the real thing. We are all about cars and trucks here, but fingers crossed we may get to see pink here in a few months! No kids myself but I could imagine one of my nieces doing the same thing. It was cute and brought a smile to my face, as I imagine it did the same for you. Guess you could say they weren’t $2.00 but Priceless. Smile given when you bought the bandaids? Priceless. Soem things are worth spending on. Just hold on to your receipt. I’m sure you will find a coupon and a sale that you can use on them to make them a real bargan. You did try your best to save money. Hope you got a raincheck on the Strawberry shortcake ones. We used up our last Hello Kitty band aid after reading Nurse Nancy for the gazillionth 🙂 time. I finally just gave in and let all of the plastic animals have owies ( we call them that too) so that my 2 1/2 year old could be a nurse. It will be money well spent when I replace them. I haven’t read all of the comments but if people are negative about $2.00 bandaids, they should be really offended by the price of gas and milk. It is not nearly as worthwhile as making your daughter’s day! I think you did what you should have sometimes it is about the wonderful moments we give our children. You need to teach them to be frugal but to also allow little things to cause joy into their world too. Way to go! I loved this story. I bought band-aids at walmart today because we needed more. I looked at the hello kitty ones for quite a while before I put boring band-aids in my cart. My hubby will be glad, but I prefer to wear hello kitty band-aids! I am 29, by the way! I teach 2 year old Sunday School and for a recent lesson on how Jesus cares for us, we had a life-size butcher paper cut out of a child. We had boxes of bandages and let the kids put them all over the butcher paper. They LOVED it! Hello Kitty Rocks!!! We have the same box of bandages and my son recently picked out Hello Kitty to cover “mommy’s booboo”. I forgot I had the band aid on my arm and headed out to the grocery store that night. There were at least 3 full grown women discussing how cool my Hello Kitty bandaid was! And while it’s a little silly, it was a nice way to share kind words and a smile with strangers. You know, sometimes it’s the little things that make us happy! I love the balance you have. Thanks for sharing your Target trip and your cute bandage story. No doubt, you will have many more great stories to share. Look forward to them all. I found a link for Nexcare bandages. Will this work, stacked with the Target coupon printed from their site? If this one will work, can I print out multiple copies? Hi, been following for a while but haven’t commented yet! Every now and then it’s nice to do that! My son really loves the character hand soap. We buy it sometimes even when it isn’t on sale! One of the reasons I coupon is so that I can give. I think it’s essential to remember to give to your family, even if it wasn’t a “deal”. 🙂 A little balance is good too. You paid $2 for a box of bandaids for the same reason I bought a box for .87 and let my kids “waste” them on their stuffed animals instead of saving them for real boo-boos. Sometimes….it’s just worth it! Your children need to know that you care more about them than you do saving money! Isn’t part of the reason that we coupon is to be able to purchase things that we want? If we want to keep a promise to our kids or simply see them smile, it’s worth any price we pay whether it’s a steal or paying full price. Did anyone else not get the Nexcare coupon in there 6/5 SS insert? I’m in south Florida …..? Good for you Mom! It is too easy to get caught up in the saving money game and forget about those dearest to us. This week I bought an expensive pound of deli meat for my family that I rarely buy and it is making me so happy to pack them yummy sandwiches in their lunches everyday. Yes! In fact, isn’t that one of the biggest reasons that we are frugal? To allow us more freedom to love on our family, friends, and others? If you can afford it, then why not? Sometimes the little things can make others so happy. I shudder to think of the FB people finding out that I took the two year old for a surprise 99 cent ice cream cone after a traumatic doctors visit. She enjoyed every bite and told Daddy all about the ice cream before mentioning the three shots and the blood draw involving three techs trying to stick her six times before it worked. Easily the best dollar I spent all week if not the entire month. If you have the money there is nothing wrong with an occasional treat. I bet your daughter will remember this for a while. Thanks for the perspective, Crystal and all the commenters. I cannot help but think that it’s because of an overall frugal approach to home economy, a simple splurge on “expensive” treats like character bandages can be made without “guilt”. Nexcare.com has a $1/1 skin care product Q which is working for the children’s bandages. Combine this with the Target Q to get them free! You made a good call with the bandages. Don’t worry because–due to your good example–she’ll be frugal as she gets older. My boys (ages 18 and 22) always ask if there’s a coupon before they buy something. My 9 yr old girl loves, (I mean loves) Justice for Girls store. They are pretty high on thier prices, but because I save all year around on so much, I’m able to take her and let her pick out some outfits & etc….. ( I normally plan it around thier 40% everything in the store deal) and she is always so happy when she gets to shop at Justice, it makes my whole week! You did exactly the right thing. Your daughter is more important than any amount of money will ever be. Kids are only little once. They only look at you like you hung the moon for a short time. You made your baby’s day for $2.19. You are not going to regret bringing a smile to her face. Everyday she is making memories and because of today, she will remember forever the day you put aside your “normal” FOR HER. They are only little once and someday we will all wish they were 4 again and living at home with their only hearts desire being $2.19 character bandaids from Target. unable to access the target beauty bag, have tried several times, but it does not load. What do they say….overpriced box of bandaids—$2.00, look of pure joy on your little girls’ face—PRICELESS!! You’re a good mama!! Thank you for keeping the MOM in Coupon Saving Mom. You are a well balanced example to all of us! Oh my, Crystal you would freak to think that I recently spent $3.99 on a pack of Dora bandages. I don’t think I’ve ever seen character bandages over here in Canada for $2 even if they are on sale. Does anyone know how often the coupons for Target change?? When will they add more new ones?I only have so few left because I have been using them up, and I need more. i love the dollar store for bandages. they have plain brown 100 pk assorted sizes (which i love) and they recently have had marvel superhero ones too (made my 4 year old son and my 29 year old hubby happy). my daughter gets the pk with all the different colors (purple, lime green, yellow…). they are always finding fake boo-boos that are magically healed 15 mins later when they take off the bandage. for that reason i love the cheap bandages!! Thank you for this suggestion! I’ve never thought to check the dollar store for bandages! It’s so cute that bandages made her day rather than candy or a toy. The best thing is that she’s probably always going to remember that you bought those Band Aids.